Kodiak Oil & Gas reported (stellar) second-quarter results on August 4th. Year-over-year oil and gas sales jumped 261%, to $22.1 million – a company record. Two days prior, the company transferred its shares from the AMEX to the NYSE. The ticker symbol did not change. On August 16th, NRG Energy announced plans to acquire retail electricity and natural gas provider Energy Plus Holdings LLC for $190 million in cash. The deal, subject to customary regulatory approval, is expected to close in October... and would significantly increase NRG's retail market presence. Billionaire Texas hedge fund manager T. Boone Pickens just bought a new stake in Schlumberger. According to an SEC filing on August 15th, his BP Capital Management plunked for $11.7 million worth of SLB shares. September 15 – 19: Off to Krakow, at the request of Polish President Bronislaw Komorowski, to address the social and economic consequences of shale gas development. September 21 – 25: Headed to Vancouver for our first Micro-Cap Energy Summit – a five-day cruise down the Pacific Coast with subscribers. I'll be giving five workshop presentations. To make some exciting last-minute plans and join us, just call (800) 926.6575 or (561) 243.6276 for more information. September 27: After disembarking from the cruise in L.A., I'm off to the Western Utilities Executive Conference in Pebble Beach, where I'll cover "market volatility and the prospects for natural gas." September 28: Wrapping up the month in Little Rock, addressing the Arkansas Independent Producers & Royalty Owners Association. As the markets fight to stabilize themselves in the wake of unparalleled volatility, not all energy components will be reacting in the same way. Following upon a deeply oversold market, there will be some immediate plays along a range of mid- to larger-sized companies from upstream oil field service and production through downstream refining and retail distribution. The best play short-term, however, is right in the middle. "Midstream" these days refers to the gathering, processing, storage and transmission of oil and gas. For the broader markets, this has always included shipping. At this point, though, crude oil tanker activity is a very separate issue. And while we have identified our preference here (see "How We Intend to Profit from a 'Tanking' Industry," Energy Advantage, July 2011), the sector is still well off from the point allowing us to make a profitable move. The midstream sector we are concerned with now is onshore. It involves the gathering, interim processing, storage, terminal operations and pipeline transmission of crude and natural gas. Currently, the condition of both oil and gas activities in the U.S. is putting a premium on these services. Much of the production place is dependent upon such midstream facilities. That's because the oil and gas does not move directly to refineries or end users. You see, before it is transmitted into the main pipeline network, it requires central locations for gathering (from various producing wells), initial treatment (to remove impurities, or separate components, in the case of gas or water from oil) and storage. The periodic problems of excessive storage at Cushing, OK— a main collection location and pipeline cross point in the U.S. – is often cited by analysts as a reason for the discounted price of oil in New York against the slightly inferior quality oil comprising the Brent benchmark in London. Cushing is the physical location for setting NYMEX daily futures contract prices for West Texas Intermediate (WTI) benchmark crude. Henry Hub, LA serves the same function for NYMEX natural gas futures. More pipeline capacity is now being used to store rather than transmit oil and gas, especially in the case of the latter. Much of that is found in gathering pipeline networks, serving as sourcing for volume moving into the main trunk arteries. This function, along with the operations of terminals, separation and processing plants and the broader pipeline conduits themselves, is what makes the midstream sector so important. That's why, as the energy sector digs itself out of a terrible two weeks of trading, a primary pop will take place in the middle of the production-transport-refining-retail chain. Producers needing to move extraction must use it. Refiners and wholesalers are likewise dependent upon the midstream companies for the raw materials used to provide finished "goods" – oil products; natural gas for electricity generation, heating and new applications for vehicle use; and a wide range of petrochemicals and byproducts. Midstream elements also transport and distribute the finished products, especially propane throughout rural areas and a variety of natural gas liquids (NGLs). Many of these midstream entities are structured as Master Limited Partnerships (MLPs). Such private structures are required by law to move profits directly to the partners themselves. When an MLP decides to issue equity shares, the paper becomes available to retail investors and trades the same as stock. These equity shares are our target, with a strong upward pressure in prices likely as the market moves out of its recent downward volatility. The MLP equity shares also have another decided advantage: income. Since they are the tradable component of a structure that requires all profits be moved to holders, the shares carry a sizeable dividend. There are 21 similarly structured, positioned and traded L.P.s or equivalents I am currently evaluating, either on my trigger or tracking lists. These midstream players cover different segments of the U.S. market. They comprise primarily oil or gas providers, with some straddling both energy sources. Some provide services only, while others provide both services and wholesale/retail networks of finished product. In short, these investment opportunities are not all reacting the same way to the instability we have witnessed in the market. 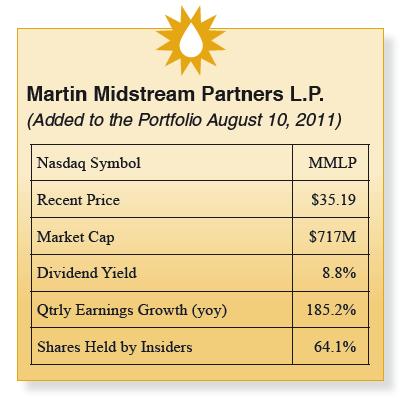 Our first play among midstream operators is Martin Midstream Partners L.P. (Nasdaq: MMLP), which I just recommended in the August 10th Portfolio Update ("Today We Fight Back: Three Plays to Recover Profits"). The shares have climbed 9.4% in the four trading sessions since then. And they carry a substantial annual dividend – presently pegged at 8.8%. If you haven't already bought these shares, do so now. We intend to use providers like Martin Midstream as an ongoing element in recovering profits and extending returns into new areas of the production-to-consumption cycle. In so doing, we'll be rewarded with both capital appreciation and dividends. MMLP clearly fits the bill here. And I shall be following with several additional picks in this category as the market stabilizes. Remember, when that happens, the energy sector – across the board – will be rising faster than the market as a whole. We will be aggressive here. So stay tuned. There will be a number of opportunities to make money moving forward. It all resulted in a hammering of stocks between July 27 and August 8. During that nine-session period, the S&P lost almost 16% of its value, while the NYMEX price for West Texas Intermediate (WTI) crude oil (the benchmark for New York trading) lost 16.4%. The energy sector largely sustained declines more severe than the market as a whole. Oil futures contracts (the paper barrels) are themselves an asset in which value is stored quite aside from the underlying crude consignments (the wet barrels). When markets panic and investors start pulling out cash to stuff in the mattress, it not only comes out of stocks and bonds. It also comes out of fungible commodities like oil. That sets up a double whammy – one hit on oil company shares and another on the oil itself. Significant portions of the existing Energy Advantage Portfolio are now undervalued, some by well over 25%. So we will be doing some dollar averaging here to lower the overall cost of your holdings. There are some significant new stock opportunities arising in the shakeout aftermath. 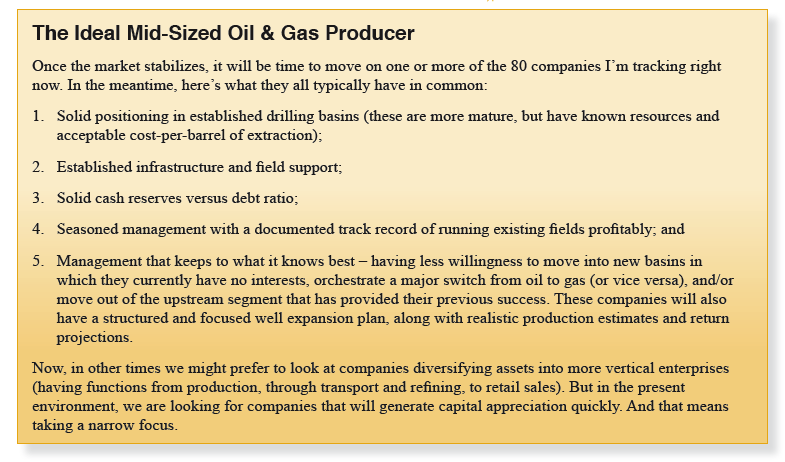 Two particular areas of note: midstream players (see page 1) and mid-sized, well-focused oil and gas producers. While it is not unusual for the big boys – such as ExxonMobil (NYSE: XOM), Chevron (NYSE: CVX), Royal Dutch Shell (NYSE: RDS) or Total (NYSE: TOT) – to post gains, the best returns will be found among mid-sized to smaller producers having well-focused plans, existing low-cost production fields and management with successful track records for making money. The trick, as ever, is to select the wheat from the chaff. At the moment, my tracking and trigger lists have more than 80 mid-sized producers under analysis. We need another week or so for the market to shake out, allowing some calls in this category. These stocks were hit hard in the July 27-August 8 downward onslaught ("downslaught? "), as was the energy sector as a whole. That makes this recovery harder to handicap, since most of the shares will be bouncing back as a reaction to investor overreaction. We are looking here for companies that will continue to advance once stabilization returns to trading. You will know as soon as it's time to pounce. To date, we have limited our exposure in the options market to buying call options on three exchange-traded funds (ETFs) directly related to oil and oil product futures – the United States Gasoline Fund LP (NYSEArca: UGA), the United States Brent Oil Fund, LP (NYSEArca: BNO) and the iPath S&P GSCI Crude Oil TR Index ETN (NYSEArca: OIL). The first two are also in the Portfolio, while OIL is not. We shall shortly supplement these limited option moves with acquiring calls in the shares of selected Portfolio members, as well as in other shares as justified. There are two objectives in buying the call options: We either want to be able to purchase the underlying shares cheaper than their market price (by exercising the call before its expiration) or generate an additional cash flow by selling the calls when they are in the money (ITM) prior to expiration. We shall be selling the calls initially to realize profit. Once again, the market volatility has wrecked havoc on options of late. But at least in this case, we only have to worry about losing the premium paid for the option when this happens, rather than the actual market prices for the 100 underlying shares in a call option. Eventually, we will want to accumulate shares. That would mean exercising the call options and purchasing the shares and/or going into the market and buying them. In addition to realizing some capital appreciation on the holdings, owning the shares in blocks of 100 allows us to sell our own call options. That, in turn, allows us to pocket the premium paid by others for the call… and some profits from the sale itself if those calls are exercised. If they are not, we still get to keep the premium and the underlying shares. The overall options portion of this strategy is intended to provide a revenue flow to balance whatever is happening in the market. And it is certainly not intended to replace the traditional buying and selling of the shares themselves. However, short-term, we are simply looking for profits. And using call options is a convenient way to do just that. To say the last month has been volatile would be an understatement. The period (through August 15th) has witnessed the worst monthly performance of the Portfolio across the board. That has been tempered considerably, of course, by the best one-week performance as the month drew to a close. All of the Portfolio members remain undervalued and, as the market recovers, so will these shares. The volatility, however, will not be disappearing anytime soon, although I do suspect that it will be less intense. Remember, it has been this volatility that had been driving the Portfolio up. And it will do so again. On the other hand, unusually heavy doses of volatility depressing share prices during what can only be termed a market panic will only be moving the entire energy sector in the same direction. Volatility is not simply the occurrence of a dramatic move up or down. In oil (and the rest of the energy sector continues to take its essential bearings from what happens with respect to the dominant source), the volatility is now coming in cycles, with more excessive spikes in either direction now occurring more frequently than in the past. It will swing back again to favor our approach as soon as the markets "stabilize" (all terms these days are relative, it seems). The July 27th through August 8th period was extraordinary by any yardstick, as measured both by the declines followed by significant recoveries in the last week. Again, all of these stocks are now undervalued. Any semblance of stability will result in gains. Big ones. With the exception of our newest entry (brought into the Portfolio after the carnage was over), the remaining 20 shares on our list were down for the month and up for the last week. But the differentials are simply astounding. The worst performing for the month was oil field service (OFS) company Basic Energy Services (NYSE: BAS), down 30.9%. But BAS was also up 19.8% over the last week. The second heaviest loser for the month was regional producer SandRidge Energy Inc. (NYSE:SD), down 28.9%. Yet it also recovered in the last week, up 23.7%. Similarly, regional producer Abraxas Petroleum (Nasdaq: AXAS) was down 25.15% for the month, but up 20.4% in the final week. Arch Coal (NYSE: ACI) has been part of the Portfolio for less than a month, unfortunately being added just as the downward volatility intensified. It was down 24.7% since its introduction, but once again up (17.5%) in the past week. The Wildcatters Exploration & Production Fund (NYSEArca: WCAT), our exchange-traded fund (ETF) following U.S. smaller-cap E&P (exploration and production) companies in both oil and gas, was down 18.7% for the month, up 8.8% during the last week. The PowerShares Global Coal Fund (NasdaqGM: PKOL), our ETF exposure to the global coal market – especially the major Asian market – lost 13.1% for the month, while graining back 3% in the last week (the lowest percentage of recovery for any member of the Portfolio). Meanwhile, Marathon Oil (NYSE: MRO), added to the list on July 5, was down 11.8% for the month and up 17.8% over the past week; while both the Guggenheim Canadian Energy Income Fund (NYSEArca: ENY), our ETF representing Canadian unconventional producers, and Baytex Energy (NYSE: BTE), also active in heavy oil and oil sands country in Western Canada, where both down 11.5% for the month. ENY rebounded 15.1% in the past week, BTE was up 10.9%. Schlumberger (NYSE: SLB), the world's leading OFS provider, was down 9.7% for the month, while up 8.7% during the final week. 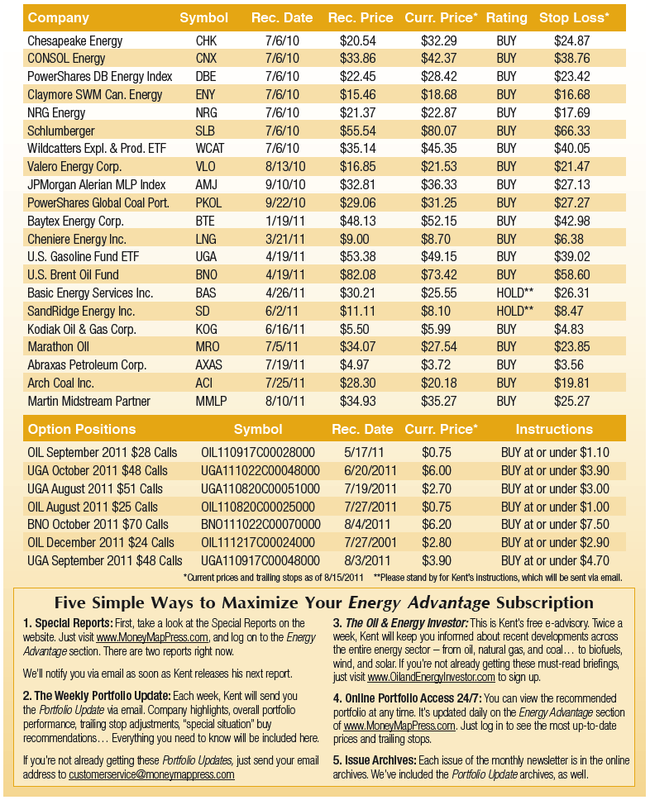 The PowerShares DB Energy Fund (NYSEArca: DBE), an ETF allowing us to track the New York-London trading differences in oil and oil products, declined 8% for the month, but rose 5% in the past week, while the United States Gasoline Fund LP (NYSEArca: UGA), our ETF tracking RBOB gasoline futures contracts (the blend traded on NYMEX), lost 7.6% for the month, but rose 5.4% in the past week. The United States Brent Oil Fund (NYSEArca: BNO) was down 3.7% for the month, but up 4.8% in the last week – reflecting the quicker recovery of Brent benchmark prices in London over West Texas Intermediate (WTI) prices in New York. The other four were indicating even stronger upside movement. NRG Energy (NYSE: NRG) lost 7.8% for the month, but gained 12.4% over the last week. The JPMorgan Alerian MLP Index ETN (NYSEArca: AMJ), our exchange-traded note (ETN) reflecting master limited partnerships (MLPs) controlling natural gas pipelines, was down 3.3%, but then up 13.8%. Chesapeake Energy (NYSE: CHK) was down 4% and then up 18.8%. And Kodiak Oil & Gas (AMEX: KOG) lost 6.6% over the month, while rebounding a very strong 20.6% over the last week. Martin Midstream Partners L.P. (NYSEArca: MMLP), our initial choice in the regional midstream gathering, processing, storage and transmission category, was up 9.4% for the four sessions it has been a member of the Portfolio. MMLP, of course, had the advantage of being added to our holdings after the brunt of the market frenzy had ended.